Search.jimbrie.com is the PUP that uses misleading techniques to prevent removal. Use Reimage to locate malicious components and get rid of them faster than with uninstall instructions. A full system scan blocks virus reappearance and prevents traffic to malicious domains. How does Search.jimbrie.com virus act? How can I get infected with Search.jimbrie.com? 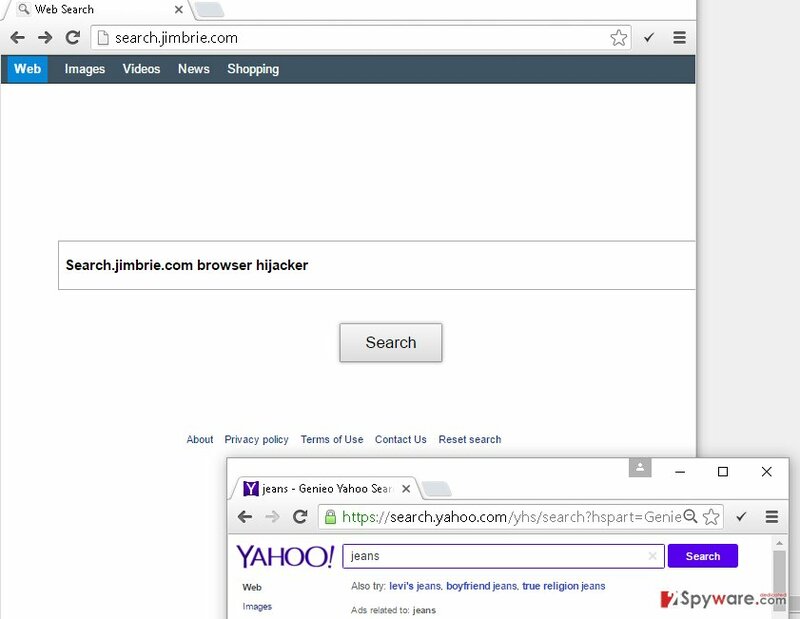 Search.jimbrie.com is a typical browser hijacker, which can be installed alongside other free programs. It is a potentially unwanted program (PUP), which deserves to be removed because it can cause various computer security related problems and worsen the computer’s performance. If you have noticed that Search.jimbrie.com has replaced your browser’s homepage, it is a clear sign that your computer was hijacked by this potentially unwanted software. In this article, we are going to explain how exactly this PUP works, how did it slither into your computer system and how you can remove it. Search.jimbrie.com hijacker is also known as Search.jimbrie.com redirect virus. This program is supposed to detect all web browsers on the PC and adjust their homepage and default search engine settings. If your computer is affected by this browser hijacker, you probably have already discovered that it changes the homepage to Search.jimbrie.com and sets this web search-providing website as your default web search engine as well. In addition to this configuration, it also makes that site as a default new tab page. Needless to say, you should not tolerate such arbitrary changes. It is really disappointing that this bogus website manages to deceive many inattentive computer users and make them believe that it is a regular search engine. However, users who have tried to search via Search.jimbrie.com report that it does not open corresponding websites once they click on the search results it provides. Search.jimbrie.com redirects them to suspicious websites that look very unreliable. The research has shown that search engine promoted by browser hijackers can trigger redirects to high-risk web pages, often filled with malicious content. To avoid cyber dangers, we strongly recommend you to remove Search.jimbrie.com and use an alternate search engine instead. Unfortunately, you cannot just set another website as your homepage because Search.jimbrie.com PUP will change your browser’s settings again the next time you reboot your computer. That is why you must uninstall Search.jimbrie.com virus from your PC first. You can do that with an anti-spyware software like Reimage. Search.jimbrie.com hijack often occurs after users install free programs downloaded from the Internet. It happens because Search.jimbrie.com spreads via bundled software. You should know that many free programs often carry additional components disguised as “recommended downloads.” Such additions are concealed behind Advanced and Custom installation settings, which computer users tend to ignore. Wrong! By selecting the traditional installation settings, such as Default or Standard, you automatically agree to install all additions alongside your preferred software. That is why you have to opt the “recommended downloads” out via Custom or Advanced installation option. Search.jimbrie.com PUP is something that you should definitely remove from your computer right away. It can only cause problems and interfere your browsing sessions, plus, it can make your computer run slow. As we have already mentioned, you can remove it using anti-malware software, but if you are looking for a manual Search.jimbrie.com removal tutorial, navigate to page 2. We assume that you do not need more arguments why Search.jimbrie.com virus should not remain on your PC. It is not useful program at any point. Besides, it is very annoying. 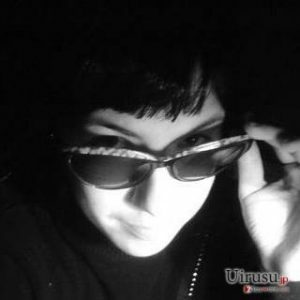 2-spyware research team has prepared a removal guide for you – you can find it below this post. Follow the step-by-step instructions carefully and make sure you do not skip any steps. It is quite easy to uninstall Search.jimbrie.com browser hijacker manually, however, if you are concerned about the safety of your computer, or simply if you would like to get rid of this PC problem using an automatic malware removal program, we recommend you to install a proper anti-malware software and remove Search.jimbrie.com automatically. Here, look for Search.jimbrie.com or any other recently installed suspicious programs. Wait until you see Applications folder and look for Search.jimbrie.com or any other suspicious programs on it. Now right click on every of such entries and select Move to Trash. When in the new window, check Delete personal settings and select Reset again to complete Search.jimbrie.com removal. Once these steps are finished, Search.jimbrie.com should be removed from your Microsoft Edge browser. Here, select Search.jimbrie.com and other questionable plugins. Click Remove to delete these entries. Now you will see Reset Firefox to its default state message with Reset Firefox button. Click this button for several times and complete Search.jimbrie.com removal. Here, select Search.jimbrie.com and other malicious plugins and select trash icon to delete these entries. Click Reset to confirm this action and complete Search.jimbrie.com removal. Here, select Extensions and look for Search.jimbrie.com or other suspicious entries. Click on the Uninstall button to get rid each of them. Here, look at the Homepage field. If it was altered by Search.jimbrie.com, remove unwanted link and enter the one that you want to use for your searches. Remember to include the "http://" before typing in the address of the page. Now you will see a detailed dialog window filled with reset options. All of those options are usually checked, but you can specify which of them you want to reset. Click the Reset button to complete Search.jimbrie.com removal process. This entry was posted on 2016-04-13 at 23:50 and is filed under Stealing programs, Viruses. You can quickly scan the QR code with your mobile device and have Search.jimbrie.com manual removal instructions right in your pocket. How did you remove Search.jimbrie.com?